Released a month before "Change Everything", "Always The Last To Know" redfined Del Amitri as being the honest, thinking mans' band. With it's painfully honest lyrics, "Always The Last To Know" displayed emotional pain from both sides of a love affair. Adding to the already long list of original b-sides, the first three were stellar in quality, with "The Whole World Is Quiet" creating a disturbing atmosphere. Released to radio is a promo disc with a remixed version of "Always The Last To Know". This remix version brings out the vocals and the keyboards more than the album version. After relative success with the uptempo "Always The Last To Know", it was decided to release a ballad next. 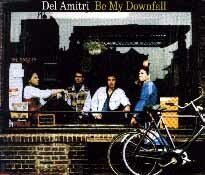 "Be My Downfall" has become a staple of Del Amitri. A song that no matter else what other hits they may have, "Be My Downfall" will always be one of everyone's favorites. A song about one man's giving in to temptations and what that weakness is going to do to his relationship. "Whiskey Remorse", another of the unreleased b-sides, is the perfect b-side to "Be My Downfall". "Whiskey Remorse" is what happens the day after "Be My Downfall". "Lighten Up The Load" is a positive, looking-forward to-seeing-your-girl-type song. Taking everyday pleasures, and turning them into pop songs is something Justin Currie does with ease. Released in two different versions, "Just Like A Man" has a swampy sexiness about it. An intoxicating rhythm that is not lost on many people. For b-sides, Del Amitri dug into their record collections to come up with three cover versions. "Don't Cry No Tears" by Neil Young and Crazy Horse; "Bye Bye Pride" by The Go-Betweens; and "Cindy Incidentally" by The Faces. Del Amitri had been playing all three songs in concert for several years. Committing them to tape was probably not a difficult ordeal. The second version of the single included a remix of "Spit In The Rain", "Scared To Live" from the "Spit In The Rain" single, and an acoustic version of "I Won't Take The Blame". Again, the single is released in two different versions. Utilising a radio remix version of "When You Were Young" on each single, the first single also includes three new songs. "Long Journey Home" is a contemplative ode to inevitable failure in life. "Kestral Road" is the only formally recorded instrumental by Del Amitri. Pushed along by dueling guitars and a plush organ played by Andy Alston, this recording is very listenable. On the second disc, are three tracks recorded "live" at The Town & Country Club in London. Included is the introduction by a "wacky" dj that rather grates on ones' nerves.